Recently I've gotten into a bit of a Matcha craze. I've always loved green tea (especially with soy milk!) 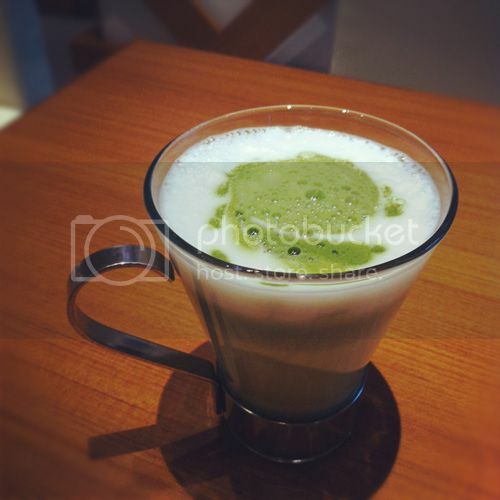 but my love for it was catapulted to a whole new level after I visited Nana's Green Tea Cafe at JCube and had probably the best Green Tea Latte in my life. It was probably a combination of factors that made that drink so perfect. Firstly, I noticed that the owner of the cafe was Japanese, which automatically makes all of the green tea drinks legit by association ;). Next, the green tea latte that came out had just the right amount of bitterness. I hate drinks that are overly sweet/sweetened so this one was just right. Added to the fact that it was a quiet cafe in the late afternoon with a really cozy ambiance and that each sip of warm latte was lifting layers of worry and anxiety (school...work...life...what's new? just a lame bunch of first world problems) off my back, I came to the conclusion that it was a perfect cup of green tea latte that was perfect for the occasion. 2. 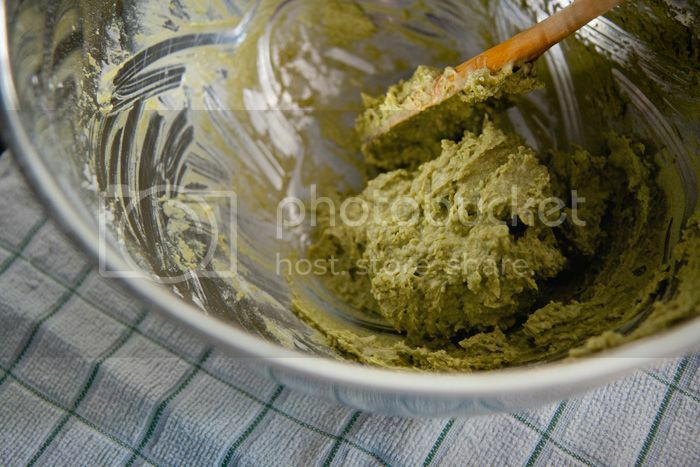 In another bowl, combine the flour, ground almonds, and matcha, and stir with a whisk to remove any lump. 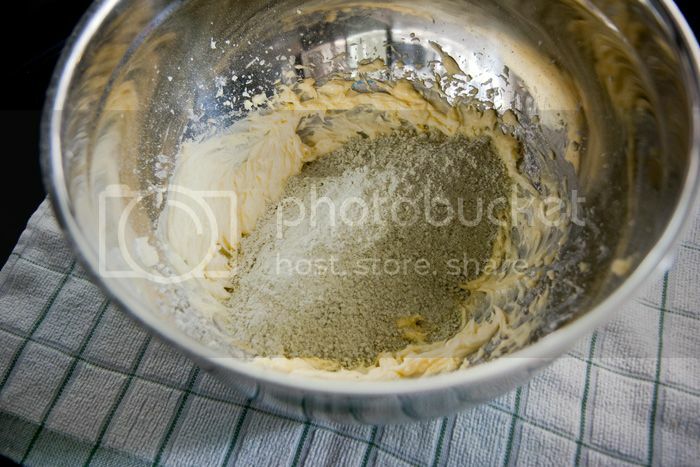 Add to the first bowl and stir it in until the mixture comes together to form a ball; don't overwork the dough. Lightly shape the dough into a ball. Wrap in cling film and place in the freezer to firm up for 40 minutes (or in the fridge for 2 hours). At this point, the mixture was really kind of moist so I'm not too sure how you're supposed to roll it into a log without adding a decent amount of flour to it. What I did was that I just placed the moist ball into cling wrap and let it harden in the fridge for about 1 hour. After that, I still needed to add about 1/4 - 1/2 cup of flour for ease of rolling it out. 3. Preheat the oven to 180° C (360° F) and line a baking sheet with parchment paper. 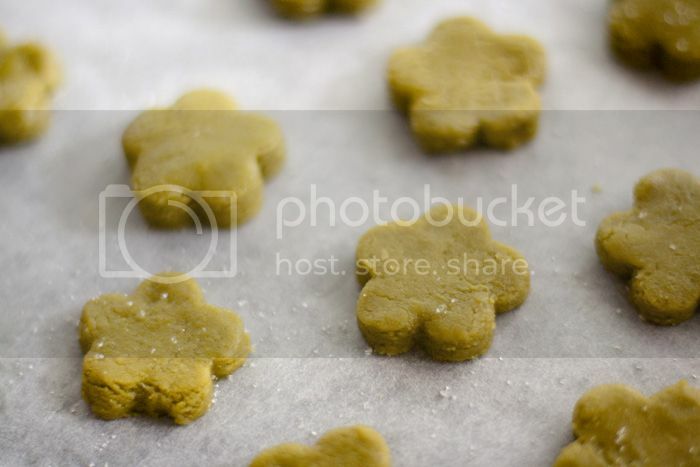 Roll out the dough on a well-floured surface till about 1/4 inch thick (it's easier to remove from the cookie cutter if it's thicker), adding flour to firm up the dough when necessary. 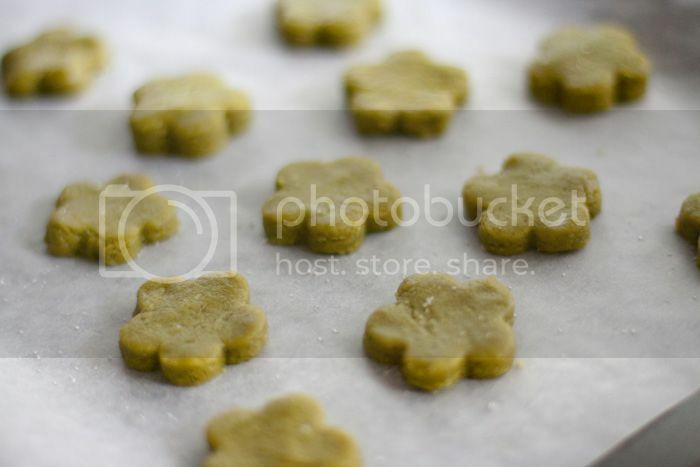 Cut out your cookies with desired cookie cutter and place on parchment paper, about 1 inch apart. For me, instead of rolling it into a log and cut using a knife as in the original recipe, I decided to roll it flat and use cookie cutters. 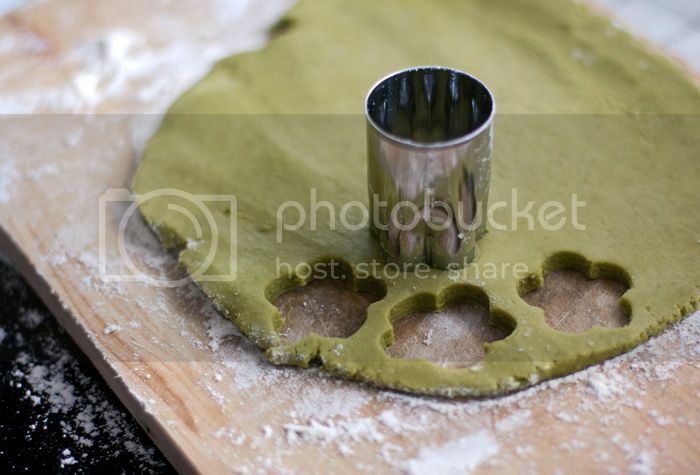 Perhaps it has to do with Singapore being an extremely humid place, because after awhile the dough started getting awfully soft and moist, making it difficult to cut out with the cookie cutters. I ended up having to chill the dough a bit longer in the fridge. So I guess just go by whatever is easier for you - you can chill it longer or add more flour to make it less moist. For extra crunch and added sweetness, I sprinkled the sugar on top of the cookies. 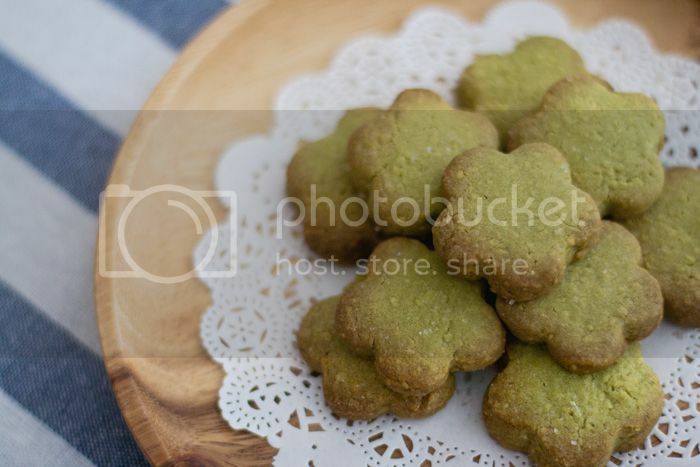 They definitely help to offset the slight bitterness of the matcha flavor if you decide to add more matcha powder. Ta-dah! :) I love how these turned out. Slightly brown at the edges and a nice pale shade of green in the center. Perfect with some actual green tea too, as my friends rightly pointed out. 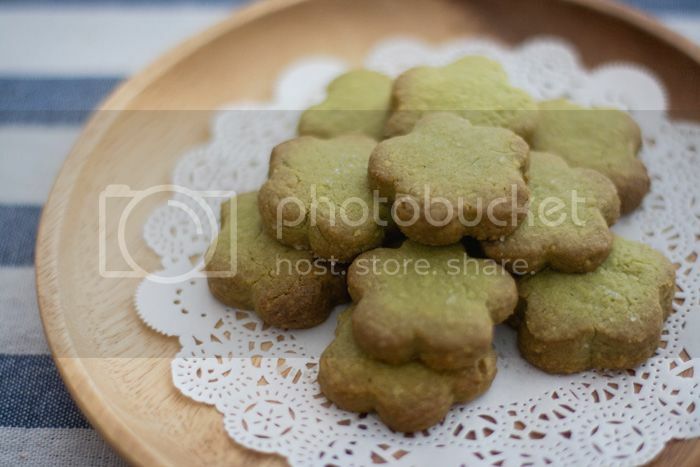 I'm so glad these turned out really tasty because they're the perfect treats for green tea lovers. Give them a go? And let me know how they turn out if you do. gasp! I looooooooooooooooooove green tea!!!!!! :0 these look so amazing! and I love that they are in the shape of hearts...Must. Try. This! Cuteee! Really love the colouring on the cookies.